Since its launch in Staffordshire in 1992, Flamesavers Credit Union has continued to grow, offering support to current and retired fire service staff across Staffordshire, Manchester, Cheshire and all fire services across the UK. Flamesavers Credit Union offer competitive loan and savings interest rates whilst returning the profits to the members. 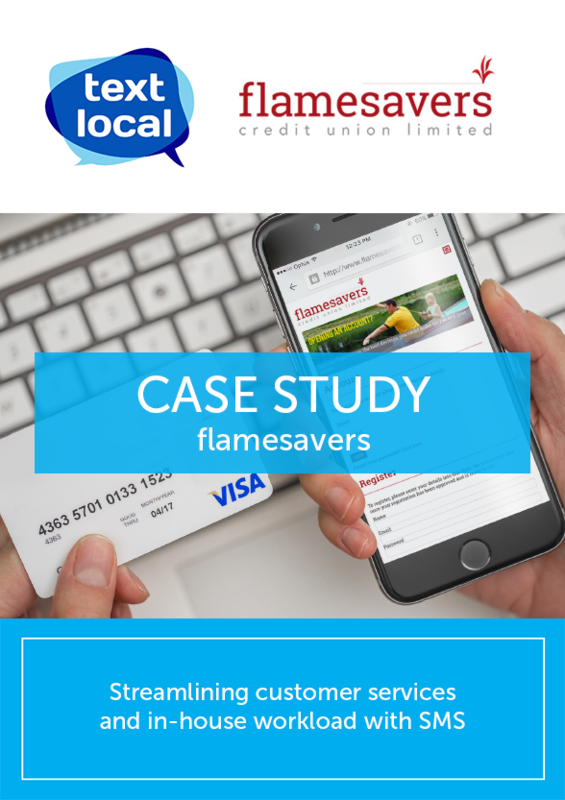 Flamesavers Credit Union started using SMS after a recommendation by another credit union as they had found it very effective. Following the recommendation, Flamesavers Credit Union are now able to deliver a variety of customer service messages, including transfer confirmations and payment reminders. The team at Flamesavers Credit Union have found that through SMS it is far easier to contact their entire membership regarding office closures, rates and offers. When sending out loan repayment reminders, Flamesavers Credit Union have also discovered their members are more likely to read an SMS where phone calls can be easily ignored or missed. Similarly, since using SMS their workload is now reduced, given that it’s now easier and quicker for members to request additional funds.